Les Mueller, one of the last remaining players from the Detroit Tigers 1945 World Series championship team, died Thursday in Belleville, Ill. He was 93. 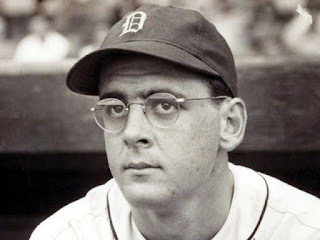 Mueller signed with the Tigers in 1937, and made his major league debut in 1941, pitching in four games before enlisting in the Army midway through the 1942 season. He went to the Jefferson Barracks Reception Center in St. Louis where his baseball skills kept him stateside. “I was 23 years old when I went into the service" Mueller said in a 2008 interview via telephone from his home. "I was in St. Louis and I stayed there. I was very fortunate. The first year I played quite a bit. We had several major leaguers and played about 70 games that summer." Muller continued to keep his skills sharp during his service, playing semi-pro ball during his breaks. Just as he was preparing to go overseas in 1944, doctors found a hernia during a physical and gave him a medical discharge. He joined the Tigers in 1945 eager to prove himself to the Detroit brass. He took whatever role the club needed, winning six games as both a starter and reliever, with two shutouts and a save. During that season, he set a major league record by pitching 19 2/3 innings against the Philadelphia Athletics on July 21st. Amazingly, he received a no-decision when the game ended in a tie after being called after 24 innings due to darkness. "I always kept hoping we'd get a run, and I'd get a win, but it didn't work out that way," he said to SABR member Jim Sargent. The Tigers won the American League pennant in 1945 to advance to the World Series. They faced the Chicago Cubs in an epic seven-game battle of the Great Lakes. Mueller was provided an immediate opportunity to contribute when was summoned in the eighth inning of the first game of the series by manager Steve O'Neill to stop the onslaught of the Chicago lineup. "It was the first game of the series that Hal Newhouser started," Mueller recalled. "He really got clobbered that day by the Cubs. I remember one or two other pitchers got in that game. I was the only pitcher that day that shut them out. I pitched the 8th and 9th innings. I walked a man and had a strikeout, but I didn't give up any hits; I felt pretty good about that." Mueller's clean slate in Game 1 was his only appearance during the series. The experience of being on the mound in that atmosphere is something he held close over 60 years later. "It was an experience I will never forget," he said. "It was a boyhood dream come true, getting to pitch in the World Series and getting a ring." Riding high off of his performance in the World Series, Mueller was confident that he would return with the Tigers in 1946. Right before the season opener, he pitched four innings of shutout ball in an exhibition game against the Boston Braves. Feeling good about his showing, he went north with the team to Detroit, eager to suit up for the season opener; however, in a cruel twist of fate, Mueller was called into the manager's office prior to the start of the National Anthem. He was completely unaware about the devastating news he was about to receive. "I go up there and George Trautman, who was the general manager at the time, said, 'We're going to send you to Buffalo.' … It was a shocker," he recalled. After a few days of contemplating his decision, he went to Buffalo where he developed a sore arm. Despite receiving expert medical care for his arm, his career was finished by 1948. He returned to Belleville and took over the family business Mueller Furniture from his dad, managing it until his retirement in 1984. Despite his relatively quick exit from baseball after his World War II service, Mueller never lost his love for the game. "I've been a continued fan," he said. "I've had season tickets to the St. Louis Cardinals since 1968." As someone who started his professional career over 70 years earlier, Mueller had his musings on the major changes he's seen in the sport. "The hitters dig in a lot more, and if they almost get hit, everybody blows up and the umpire runs outs and warns the clubs," Mueller lamented. "That's been kind of exaggerated and takes something away from the pitchers. The biggest thing that has made the home run so prevalent is the thin handle bat. Hank Greenberg's and Rudy York's bats were like wagon tongues. Now they get more bat speed with these bats. I picked up some of the bats the guys they used in our days, [and they] were heavy and big. I don't think a lot of guys who hit home runs now could swing those bats."